Morels and Carrots and Crab Meat Oh My! Morel mushrooms are only available for about two weeks in the spring time and are outrageously expensive to get fresh. Mr. Dr. decided to spend the money this year to get them shipped out. While this is a delicious and special treat, there is a bit of a panic factor; what are we going to do with them? We got some ingredient inspiration from the rest of the menu. Cathy had tasked me with figuring out how to make a dish she had at our anniversary dinner. 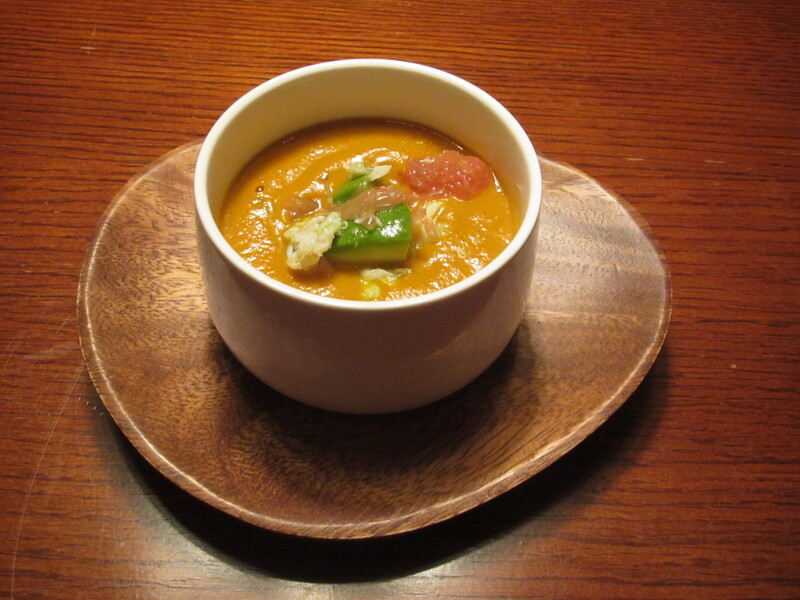 The dish in question was a carrot soup made with ginger and Thai spices. It also had a salad of avocado, grapefruit, and crab meat to top it off. Buying an entire tin of crab meat for a small salad seemed a waste so I decided to make crab cakes as well. We searched for ideas involving crab meat and morels and decided to stuff them. The filling was a mix of crab, mayonnaise, Parmesan cheese, and mustard. The morels were stuffed, then sautéed in butter and garlic and finished in the oven. The question of what wine to pair with the morel dish is an interesting one. Do you pair to the earthy morels, or do you pair with the shellfish filling? We chose to do neither and just open a bottle we wanted to drink. Ravenswood Old Hill Zinfandel 2011. The Ravenswood is a very big wine, (not surprising from a producer with the motto “No Wimpy Wines”) with strong sour cherry and spice notes. 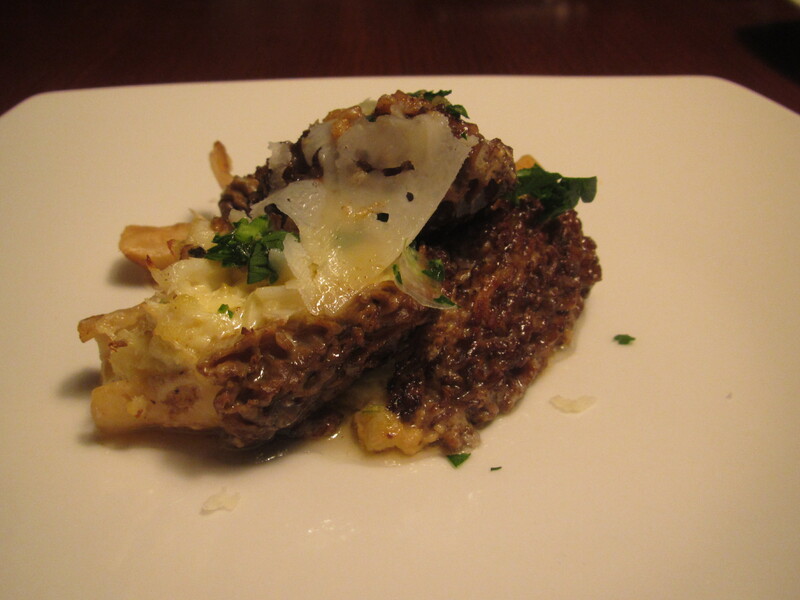 Shockingly, it went very well with the morel dish and was a distinctly positive pairing. The carrot soup was a perfect example of “wing it and see what happens” gone right. I was able to deduce the basics of the soup from tasting it. The rest was put together from the menu description and some common sense in the kitchen. I cooked down chopped carrots, shallots, ginger, and a bit of garlic and Thai curry powder in vegetable stock. Once it was reduced enough and the carrots were soft, I ran it through the blender and added salt, pepper, and heavy cream. The soup was ladled out, and the crab, avocado, and grapefruit salad was placed on top. While the soup was reducing, I prepared the crab cakes. 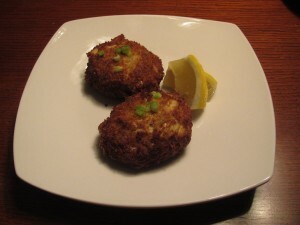 I have done crab cakes before, and I may have even included a recipe on this blog. I have tried them in a variety of preparations and with multiple ingredients and have come to two truths about them. First, less is more. I have seen crab cakes recipes with ingredient lists that fill the page. I have found that mayonnaise, good mustard, an egg for binding, old bay seasoning, crab meat, and some panko is all you need. The second is; Thou shall fry thy crab cakes. Broiling is a sin and those who break this commandment shall be cursed with bitter crab cakes. Their guests shall speak ill of the food behind their napkins and ask for more sauce to hide the taste. 1 lb Carrots, peeled and chopped. 1) In a medium pot, melt the butter and sauté the shallots, garlic, ginger and carrots over medium heat until slightly softened, about 10 minutes. Add the Curry powder and stir to coat, about 2 minutes. 2) Add the vegetable stock and simmer uncovered for about 25 minutes, or until carrots are soft. 3) While the soup is simmering, make the salad by tossing the crab meat, avocado, and grapefruit together with the juice from the grapefruit. 4) When the carrots are done, pour the soup into a blender and blend smooth. 5) Return blended mixture to the pot and add cream. Salt and pepper to taste. Serve the soup with the salad directly on top. 1) Whisk together the mayonnaise, mustard, old bay, and egg. 5) Coat the patties in the rest of the panko to form a thin crust. 6) Fry in shallow oil until golden brown on both sides, about 1-2 minutes per side. 7) Serve with slices of lemon.